In June, the Columbia Institute’s Centre for Civic Governance released the first annual progress report on the 18 federal and 24 provincial/territorial policies that it had identified in its 2016 report, Top Asks for Climate Action: Ramping Up Low Carbon Communities . The 2016 report focuses on local government issues and the policy support they need from the federal, provincial and territorial governments in the areas of capacity building, funding, buildings, transportation and smart growth. The 2017 Report Card credits the federal government for some accomplishments – such as establishing a national price on carbon – and highlights nine key areas where “room for improvement” remains. These are: 1) establishing scientific GHG targets that will meet Paris Agreement commitments; 2)Establishing a mechanism that will guarantee new infrastructure spending that won’t lock Canadians into a high carbon path; 3) Moving faster on eliminating fossil fuel subsidies; 4)Providing more robust tools for retrofitting homes and commercial buildings; 5)Providing all communities with energy, emissions and natural capital baseline data; 6) Prioritizing transit and active transportation over auto-only infrastructure; 7) Giving priority to community and Indigenous -owned renewable energy projects to advance energy democracy in Canada; 8) Developing a national thermal energy strategy; 9) Helping local governments transition to low carbon fleets. A June 5 article in the National Observer summarizes the report, and provides response from the federal government. A second new report, Re-Energizing Canada: Pathways to a Low-Carbon Future , takes a more academic approach, but includes many of the same issues. The report, published by Sustainable Canada Dialogues, is the product of input from Canadian academics and First Nations, establishes a framework of our energy system, and examines the important issues in Canadian energy policy with statistics and analysis. The report identifies governance issues as central to a successful low-carbon energy transition, and states: “we believe that the key barriers to accelerating the low-carbon energy transition are social, political and organizational.” Many of its recommendations relate to governance structures needed for policy harmonization. Re-energizing Canada was Commissioned by Natural Resources Canada in Fall 2016, and published by Sustainable Canada Dialogues, a Canada-wide network of over 80 scholars from engineering, sciences and social sciences. It is an initiative of the UNESCO-McGill Chair for Dialogues on Sustainability and is housed in Montreal. “A New National Prize: Making Clean Energy the Next Oil Sands” by Clare Demerse and Dan Woynillowicz appears in the September October issue of Policy magazine. The article distills the findings of the UN-backed study, Pathways to Deep Decarbonization, in which research teams from 15 countries, including Canada, proposed strategies for national energy reform that will allow us to limit global temperature rise to below 2 degrees. The report of the U.N.-based Pathways project was presented to the Secretary General in July, to support the UN Climate Summit in September. The press release and details of the Pathways project is at: http://unsdsn.org/news/2014/07/08/ddpp-press-release/. The Demerse/Woynillowicz article summarizes the overall findings and focuses on the Canadian findings, including that by 2050, wind and solar sources could comprise 27% of Canadian electricity generation, up from 2% today. The article concludes by proposing two simple policy changes to kick off a stronger commitment to clean energy in Canada: more favourable tax treatment for power storage and solar technologies, and consumer incentives for electric vehicles. See “A New National Prize” at: http://policymagazine.ca/pdf/9/PolicyMagazineSeptember-October-14-DemerseWoynillowicz.pdf. 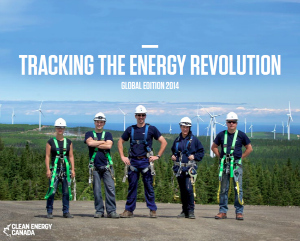 Citing the “wave of hope” generated by the People’s Climate March, on Sept ember 21, Clean Energy Canada released its first-ever annual review, called Tracking the Energy Revolution: Global Edition at: http://cleanenergycanada.org/2014/09/21/tracking-energy-revolution-builds-surging-wave-hope/. With maps, photos and infographics, it is loaded with statistics that reveal the extent of the global shift to renewable energy by governments and businesses.